Follow the cues and find out why he landed the interview call and got selected for the job, which is considered unconventional for a B.Tech student. Harshwardhan Pareek talks about how he got his first interview call, courtesy the AMCAT. Can an engineer in electronics and communication go down a route as different as digital marketing? It’s possible – if you are able to find suitability with it and with your interests. 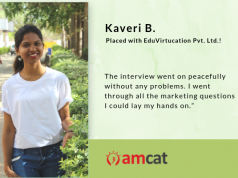 And that’s the learning we received from this AMCAT Testimonial. Follow the cues and find out why he landed the interview call and got selected for the job, which is considered unconventional for a B.Tech student. 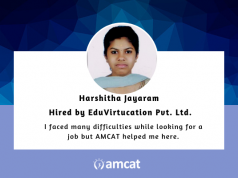 This is Harshwardhan Pareek’s AMCAT Success Story. 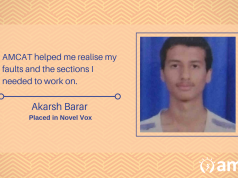 Harshwardhan, a 2017 graduate from the BK Birla Institute of Engineering & Technology, was looking for an off-campus placement. And trying very hard. 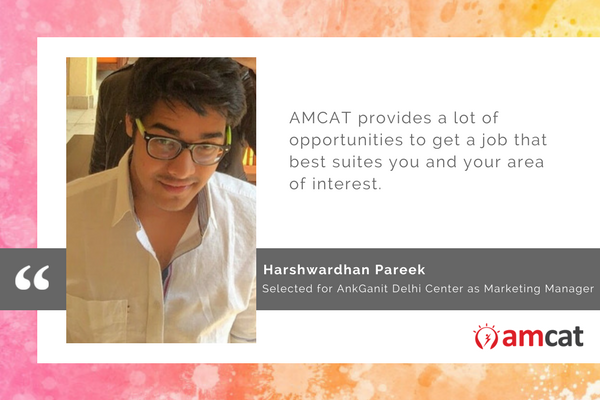 For Pareek, AMCAT became an instant hit, landing him his first interview call within the month. The interview call with AnkGanit Delhi Center came later. He ended up recommending it too. Congratulations, Pareek! We hope you have a strong road map ahead. And that your trajectory serves as an inspiration, in the form of an AMCAT Testimonial for others. Next articleWhat Is The AMCAT Exam And What Should You Know About It?